The Joint Strike Fighter (JSF) is a multi-role fighter optimized for the air-to-ground role, designed to affordably meet the needs of the Air Force, Navy, Marine Corps and allies, with improved survivability, precision engagement capability, the mobility necessary for future joint operations and the reduced life cycle costs associated with tomorrows fiscal environment. JSF will benefit from many of the same technologies developed for F-22 and will capitalize on commonality and modularity to maximize affordability. The Joint Strike Fighter (JSF) originated in the early 1990s through the restructure and integration of several DoD tactical aircraft and technology initiatives already underway. The DoD goal was to use the latest technology in a common family of aircraft to meet the future strike requirements of the Services and US Allies. In 1993, the Defense Advanced Research Projects Agency executed a program to develop a supersonic Short Take-Off and Vertical Landing (STOVL) aircraft as a replacement for the AV-8B Harrier. At about the same time, the Department of Defense (DoD) considered canceling the Navy's Advanced Attack/Fighter (A/F-X) that was being studied to fill the void left after the cancellation of the General Dynamics/McDonnell Douglas A-12 Avenger II aircraft being designed for the U.S. Navy. Senior leadership at the Pentagon suggested a Joint Attack Fighter (JAF) to replace the Navy's A/F-X program. Not only would the JAF be much cheaper than the A/F-X, it would also be designed with a common airframe suitable to the three services. It was believed that such an aircraft would herald significant manufacturing and operational cost savings. Much of the philosophy surrounding the JAF would later be incorporated into JAST, such as its single-engine design and its unprecedented level of commonality. The Joint Advanced Strike Technology (JAST) Program was initiated in late 1993 as a result of the DoD Bottom-Up-Review (BUR). The Bottom-Up Review determined that a separate tactical aviation modernization program by each Service was not affordable. The major tactical aviation results of the BUR were to continue the ongoing F-22 and F/A-18E/F programs, cancel the Multi-Role Fighter (MRF) and the A/F-X programs, and curtail F-16 and F/A-18C/D procurement. Acknowledging the need for the capability these canceled programs were to provide, the BUR initiated the Joint Advanced Strike Technology (JAST) effort to create the building blocks for affordable development of the next-generation strike weapons system. The JAST program office was established on 27 January 1994. Its mission was to define and develop aircraft, weapon, and sensor technology that would support the future development of tactical aircraft. The program subsequently moved from a broad, all-encompassing program to one that would develop a common family of aircraft to replace several aging US and UK aircraft. By the end of 1994, the JAST program had absorbed the DARPA Common Affordable Lightweight Fighter (CALF) program. CALF, then renamed ALF, became the primary focus of JAST. However, JAST was also considering modifying the CTOL versions of the aircraft to perform in a STOVL role. Congress subsequently mandated the merger of JAST with the DARPA Advanced Short Take-Off / Vertical Landing program. As JAST was already considering STOVL variants, this merger was accommodated with comparatively little disruption. The JAST Program initially explored a wide range of potential strike warfare concepts using six-month, Concept Exploration (CE) study contracts awarded in May 1994. The findings of the CE studies showed that a "tri-service family" of aircraft was the most affordable solution to the collective joint-service needs. The tri-service family would entail a single basic airframe design with three distinct variants: Conventional Take-Off and Landing (CTOL) for the U.S. Air Force to complement the F-22 Raptor and replace the aging F-16 Fighting Falcon and the A-10 Thunderbolt; Short Take-Off/Vertical Landing (STOVL) for the U.S. Marine Corps to replace both the AV-8B Harrier and the F/A-18 C/D Hornet; and a Carrier (CV) variant for the U.S. Navy to complement the F/A-18 E/F Super Hornet. Following numerous trade studies, two critical decisions were made: the JAST family of aircraft would be single-crew and single-engine. Navy attack/fighter aircraft have been preferred to have two engines in case one is lost during flight. The choice of a single-crew aircraft was accepted - subject to continued studies and appropriate technology maturation - on the projection that a single crewmember could perform all of the intended missions. Boeing, Lockheed Martin, McDonnell Douglas, and Northrop Grumman were each awarded fifteen-month Concept Definition and Design Research (CDDR) contracts in December 1994. Northrop Grumman and McDonnell Douglas/British Aerospace teamed shortly after the CDDR contracts were awarded. The contractors refined their Preferred Weapons System Concept (PWSC) designs and performed a number of risk reduction activities (e.g., wind tunnel tests, powered-model STOVL tests, and engineering analyses). In the spring of 1995, all three of the contractor teams selected derivatives of the Pratt & Whitney (P&W) F119 engine to power their aircraft. 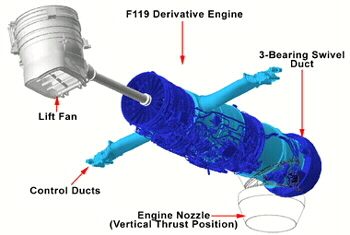 Accordingly, in November 1995, P&W was awarded a contract for preliminary design of each of the primary JSF engine concepts. Concurrently, General Electric was awarded a contract to investigate whether the GE F110 or YF120 could be developed into an alternate engine for one or more of the JSF variants. In 1996, the YF120 was identified as the "best fit" for a tri-service solution and GE initiated preliminary design efforts. After a review of the program in August 1995, DoD dropped the "T" in the JAST program and the JSF program has emerged from the JAST effort. Fiscal Year 1995 legislation merged the Defense Advanced Research Projects Agency (DARPA) Advanced Short Take-off and Vertical Landing (ASTOVL) program with the JSF Program. This action drew the United Kingdom (UK) Royal Navy into the program, extending a collaboration begun under the DARPA ASTOVL program. Several Defense Acquisition Board (DAB)-level program reviews were conducted in late 1995. The final Requests for Proposal (RFP) were issued to the contractors in March 1996. In May 1996, JSF was designated an Acquisition Category I, DoD acquisition program. In June, the weapon system prime contractors submitted their Concept Demonstration Phase (CDP) proposals. A formal Milestone I Acquisition Decision Memorandum was signed by the Under Secretary of Defense (Acquisition & Technology) on 15 November 1996, clearing the way for the award of CDP prime contracts to Boeing and Lockheed Martin on 16 November 1996. USN-Multi-role, stealthy strike fighter to complement F/A-18E/F. Carrier operations account for most of the differences between the Navy version and the other JSF variants. The aircraft has larger wing and tail control surfaces to better manage low-speed approaches. The internal structure of the Navy variant is strengthened up to handle the loads associated with catapult launches and arrested landings. The aircraft has a carrier-suitable tailhook. Its landing gear has a longer stroke and higher load capacity. The aircraft has almost twice the range of an F-18C on internal fuel. The design is also optimized for survivability. The Lockheed Martin X-35 concept for the Marine and Royal Navy variant of the aircraft uses a shaft-driven lift-fan system to achieve Short-Takeoff/Vertical Landing (STOVL) capability. The aircraft will be configured with a Rolls-Royce/Allison shaft-driven lift-fan, roll ducts and a three-bearing swivel main engine nozzle, all coupled to a modified Pratt & Whitney F119 engine that powers all three variants. The Boeing X-32 JSF short takeoff and vertical landing (STOVL) variant for the U.S. Marine Corps and U.K. Royal Navy employs a direct lift system for short takeoffs and vertical landings with uncompromised up-and-away performance. JSFs integrated avionics and stealth are intended to allow it to penetrate surface-to-air missile defenses to destroy targets, when enabled by the F-22s air dominance. The JSF is designed to complement a force structure that includes other stealthy and non-stealthy fighters, bombers, and reconnaissance / surveillance assets. 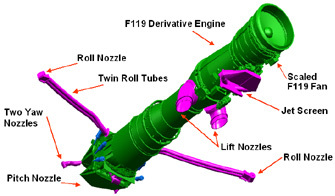 The JSFs approved acquisition strategy provides for the introduction of an alternate engine during Lot 5 of the production phase, the first high rate production lot. OSD is considering several alternative implementation plans which would accelerate this baseline effort.